“My Name Is Rachel Corrie,” a one woman show, taken from the writings of Rachel Corrie and edited by Alan Rickman and Katharine Viner premieres this weekend ony, Saturday, Nov. 12 and Sunday, Nov.13 in Adams State’s own Xperimental Theatre at 7:30 p.m. “My Name is Rachel Corrie” is a powerful and compelling story about one young woman who sought to find purpose in the world greater than her. Spending her whole life in Olympia, Washington where she grew up, Corrie decides her soul is nomadic and that she must leave this place where she has felt stuck her whole life. Corrie becomes deeply involved in US foreign affairs while studying at Evergreen State College and finally discovers the issue that is bigger than her, something that she can truly fight for: the plight of the Palestinian people. This play tells the story of Corrie joining the International Solidarity Movement (ISM), going to Gaza to fight the demolition of civilian homes, and all the joyous and devastating sights she sees along the way. This play is not only a story that is more relevant today than ever but also a story we can all relate to and take something from. Corrie is a young woman who each of us can find a piece of in ourselves. This play exemplifies the struggle for Corrie to discover herself, and then to leave self behind so that she can fight for others who are literally half a world away. This kind of unconditional love for human life all over the world is a beautiful message that will encourage anyone who watches the play to step outside of their own world and realize that we must fight for those who cannot fight for themselves. 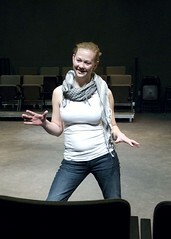 Jenna Neilsen, theatre professor at Adams State College, portrays beautifully the part of Rachel Corrie, and a few others in this one woman show. Experience a night of exquisite and dramatic theatre that is sure to have you thinking about the strength of one voice in the world and the impact you can have in it. Rachel Corrie went to Gaza for peace, what will you do?